This is a case scenario of a 19 years old female patient who was admitted to our hospital for bilateral lower limbs weakness. Viewers are advised to read the case scenario and suggest a possible diagnosis or a differential diagnosis. Answers and discussion of the case will be posted after a few days. 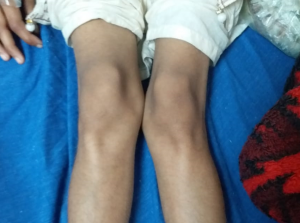 A 19 years of age female student, a resident of Kashmir was brought to the medical OPD with ten days’ history of bilateral lower limbs weakness. Ten days back, the patient developed lower limb weakness, which progressively worsened over time and she became bed bound. There was no history of trauma, loss of consciousness, seizures, urinary retention or bowel complaints. The patient denied any previous history of similar episodes. The systemic inquiry is unremarkable. On examination, the patient was a short-statured, lean patient, well oriented and cooperative. Vitals signs of the patient were stable. There was no pallor or icterus but she had knocked knees. Neurological examination of the lower limbs revealed hypotonia and reduced power in both the lower limbs (both proximal and distal muscles power was 2/5). She had normal reflexes and a normal sensory examination. Cranial nerves examination and fundoscopy were normal. Other system examination was unremarkable. Her Baseline investigations were done. 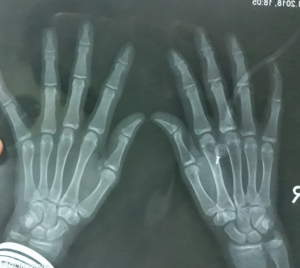 What is the possible diagnosis/ differential diagnosis? 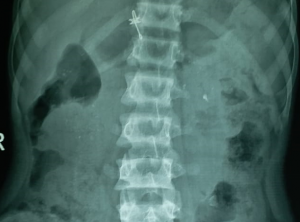 How should we manage this patient? Reasons: Patient has normal anion gap metabolic acidosis with a disproportionately high urinary PH, Hypokalemia and Nephrocalcinosis. Management of the patient includes therapy with an alkaline agent like sodium bicarbonate and replacing potassium and citrate. A discussion on Renal Tubular acidosis will be posted soon! 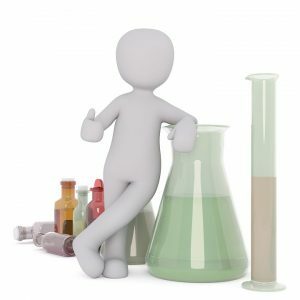 Next articleRenal Tubular Acidosis (RTA) – key points to remember! Hyperchloremic, hypo kalemic normal anion gap metabolic acidosis. 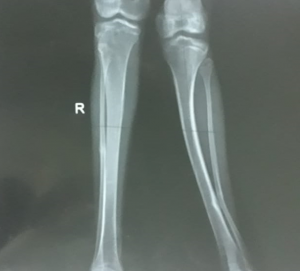 It is a case of RTA where loss of calcium would lead to the osteopenia. Urine pH suggest distal type 1 renal tubular acidosis. Basic urine leads to accumulation of calcium in kidneys paranchyma and would also cause stones. Which also only occurs in type 1 RTA. Its distal renal tubular acidosis. Differential diagnosis would be gitelman syndrome and bartter syndrome. Management of distal RTA is oral bicarbonate. Potassium replacement. For nephrocalcinosis citrate can be given because it is antagonist of calcium stone. Typhoid fever in pakistan – role of typhidot! !